A few weeks ago I was riding along in the backseat of the car, late at night in rural Pennsylvania. Because it was late at night, and rural Pennsylvania, and because I couldn't really hear much going on in the front seat over the cacophony of children's music through the stereo, I was looking out the window. Toddler, who was sitting next to me, was adding to the cacaphony while looking out the window and trying desperately not to fall asleep. I'm sure you've seen it ... the random shrieking, the loud singing, and the rhythmic kicking of the seat in front of him, all to keep those eyes from drifting closed.... If you haven't seen it, I will say it can be a treat to watch if you bring ear plugs. All things considered, conversation between the front and the back seat was next to impossible, and with Toddler so wired, I was forced to do my impersonation of the invisible woman to avoid "engaging him" any more than absolutely necessary. Sitting in a dark car being quiet meant I had little but my imagination to entertain me on the long drive. Leaving me alone with my imagination is not always wise. I'm looking at these three stars that make up "Orion's belt," and I am thinking, "Why, yes, that is a pretty darn distinctive group of stars. I can certainly understand how any human would be attracted to it as a group." I don't know that I would have come up with "belt," though. I mean, to have a "belt" you probably have to have a "person" to wear the "belt," and that is where I lose it. I'm looking all around the nearby stars, and without one of those star charts that draws the lines between the stars to show me the whole constellation, I just don't see a man out of it. Actually, even with one of those star charts, I am hard pressed to get a "man" out of that drawing. I mean, look at it -- the guy has no head! Even better, he has no feet, either! 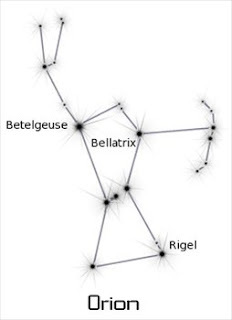 Apparently, those two stars, Betelgeuse (why am I humming?) and Bellatrix (oh, no! Sirius Black, look out!) are Orion's shoulders, and Rigel and the other one at the bottom are his knees. So, apparently, we have a hunter with no head, nothing below his knees, and from my view of the picture, the absolute longest fingers EVER. I just don't get how any Greek looked up in the sky and saw "hunter" from this. What I'm really wondering is if something got lost in the translation. Maybe there were a couple of people standing on a hill, telling stories, and someone said to someone, "Hey, you ... write this down. Draw these stars. Start with that one up there, then draw a line to that one --no, no, that one over THERE right above the tree -- and then come down to where my finger is pointing ..." I mean, I can easily see how this somehow got all botched up. At some point, though, I would have thought someone would have looked at the pictures and figured out something was wrong. But no. This sort of distortion appears in constellation after constellation. Somehow everyone had this same sort of warped perspective. Was eyesight really different back then? Were there a lot of distorted looking people running around that don't exist anymore? Was Erik Von Daniken really right about extra-terrestrials after all? Did they all have a secret set of Pablo Picasso glasses? Alas, I think the answer must be fairly obvious. It had to be the moonshine. Either that or mass hallucination. I suspect they are actually the same thing. The only question I have left is whether I would be brave enough to try that moonshine if someone gave me a cup today. 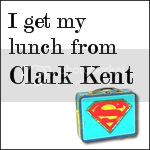 Thanks for crackin' me up, Karin! Reminds me of Andy Rooney and his famous, "Why is that?" Okay, your comments have definitely got me cracking up. Molly, I would have been lost right along with you.